In the past, tumors were often treated based on where they first presented. In the lung, they were treated as lung cancer. In the prostate, odds were that a prostate cancer protocol would offer the greatest hope for a cure. The difficulty with starting treatment based on location, however, is that not all tumors follow the same road map. Now that genetic profiling of cancer cells can be done with a blood test, the reasons some tumors don't respond as expected are becoming clearer. "Tumors shed cells and DNA into the blood stream. 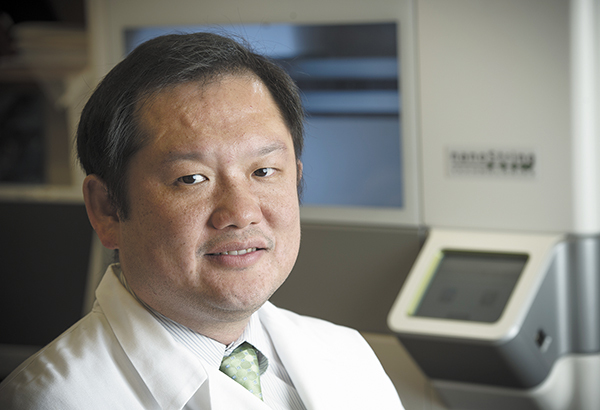 We can send a blood sample for analysis to learn more about which genes and mutations are involved, what the cancer's drivers are and where those targets might be vulnerable to treatments that may already be available," Eddy Yang, MD, PhD, deputy director of UAB's Hugh Kaul Precision Medicine Institute, and director of the UAB Molecular Tumor Board, said. A relatively new concept, precision oncology is changing how cancer care is provided. It uses the genetic signature of the tumor to determine optimum therapy. "Precision oncology uses a great deal of informatics to help us understand not only the genetic profile of the tumor, but also other factors that may influence what is happening, from environmental risks to diet and family history." Yang said. "Mutations are common, but in healthy people repair systems are in place to correct those errors. When those repair systems stop working, we need to understand why. The more we know about that particular tumor, the more effective we can be in stopping it." In a current proof of concept trial, precision oncology researchers are seeing some exciting results. One of these success stories is about Mickey Nunn, a patient from Gadsden who has been fighting prostate cancer since 2008. "After dozens of rounds of radiation and chemo, plus another treatment with some painful injections, my PSA's had gone all the way up to 99. We were out of anything else to do, out of savings and we didn't know where to turn next," Nunn said. "Then I saw a story about this on NBC news. My wife was going to call New York the next day to see if I could get information on a trial. But about 15 minutes before she could call, UAB called and told me I fit the criteria for that same trial they were doing here. The timing was like an answer to a prayer." Yang said, "The precision oncology proof of concept trial is open to cancer patients who haven't responded well to standard therapy, but who are still strong enough to benefit. In this case, one of the differences we saw between the genetic profile of these cells and typical prostate cancer cells was the presence of a gene that is often found in women who develop breast or ovarian cancer. After studying the drivers and molecular factors involved, we identified a drug approved for ovarian cancer that looked like a strong possibility. Olaparib, marketed under the name Lynparza, is designed to work on a similar target." "I was the first man who had ever taken it," Nunn said. "The first month, my PSA numbers fell from 99 to 64. Last time it was checked, I was down to around 10. I went from hurting all the time and not being able to do much of anything for years, to mowing the yard and washing my truck. Dr. Yang and everyone on the team have been wonderful." In the future, profiling the genetics of a patient's cancer cells is likely to become the standard of care and one of the first steps in treatment. "The simple blood draw, or 'liquid biopsy', isn't as invasive as a surgical biopsy, so we can repeat it as needed. We can look for key mutations or changes in the copy number of cancer driver genes and then turn to medications that are known to target these mutations," Yang said. "As treatment continues, we can track how well the patient is responding with follow up blood tests." Soon, precision oncology will be saving cancer patients from the delays, side effects, pain and economic burden of treatments that aren't likely to work and moving them more to treatments that will probably be more effective. It should be a game changer that will save many lives.